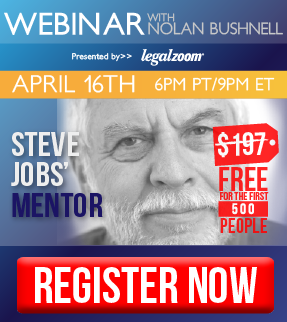 Nolan Bushnell is the iconic entrepreneur who founded Atari and mentored Steve Jobs early in his career. He also founded Chuck E. Cheese and Brainrush. The webinar will be held online at 6PM PST on Thursday April 16th and Business Rockstars are making it available to the first 500 people to sign up. Click here to find out more and sign up.